On your right hand side, you'll see Paris' only vineyard producing winery-quality grapes. French winemaking usually brings to mind vineyards of Provence or Bordeaux, where clean air abounds, not a tiny plot of property in and among a busy city like Paris. Regardless, wine is made in Paris every year, even though it's considered by most to be undrinkable. Instead, the wine is auctioned off each year to people keen to engage to own this undrinkable wine as a curio all in the name of charity. Continue to climb Rue Saint-Vincent as it veers around to the right to reach Sacre Coeur. Local's tip: 99% of visitors to Paris only ever approach the Sacré-Coeur from the front, elbowing their way through crowds and less-than-scrupulous trinket sellers. But, by following Rue Saint-Vincent you arrive at the back of the iconic church, and experience its majesty in a calm, tourist-free zone. Building of the Basilique began in 1875 and was finished in 1914. The architect behind the design, Paul Abadie made extensive use of travertine which is full of calcite which is drawn to the surface whenever water runs over the Basilique's stone, making it self-cleaning. You can see the difference between the parts that are exposed to the rain and the dirtier and darker stone that is covered, a depth is an effect which the architect intended. When the Sacre-Coeur is lit up at night it seems oddly two dimensional. Entry is free. Once you've investigated the interior of the church, send some time taking in the grand panoramic views across all of Paris. After visiting the Sacre Coeur Basillica in the Montmartre neighborhood of Paris, walk along Rue Azais. 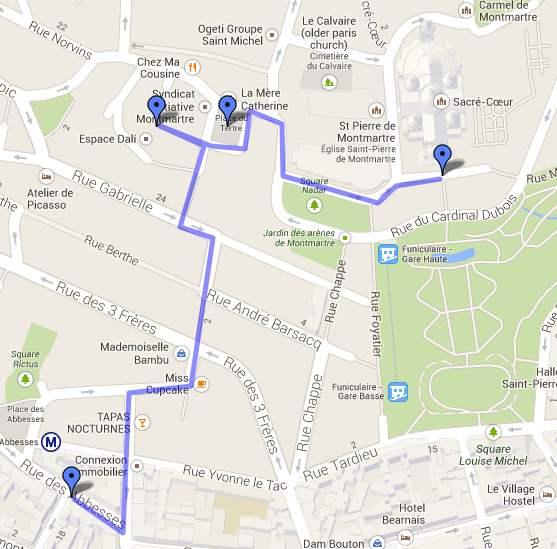 Stick to the right, and turn left onto Place du Tertre. Place du Tertre The Place du Tertre is what is known as the Artist' Square. It's a place where artists work on their paintings while also to stopping for a bite to eat. In the nineteenth century lots of the distinguished artists would come here to make money by painting strollers by, a tradition that's continued to today. This could be the place to come in Paris for a portrait, but never accept the first quote you are given if you are in fact looking to buy a portrait. From the Place du Tertre head down the stairs to L'Espace Dali. L'Espace Dali This museum focuses on the work of Salvador Dali and opened in 1991 (two years after Dali's passing). The location is significant as it's just a few roads away from where Dali lived. Montmartre was at the center of the 1920s surrealist movement. Visiting the Dali exhibit provides you with the impression of entering the maze of Dali's perverted thoughts as seen through a collection of Dali's sculptures. It's open everyday from 10am until 8pm, and entry is 11€. Enter the museum and spend some time getting inside the head of Salvador Dali.